If you’re looking for some truly serious rocking blues with a punch, then Portland-based Lightning Kings’ new release The Road is My Throne will be right up your alley. This is engaging recording that hits you right from the get-go on the opening number “Rules of The Road.” Sharp guitar licks backed by a horn section and thundering organ throughout. It is a mixture of the sound of the old world school of classic rock baptized directly in the muddy waters of the blues, yet offering some funky variations at times through this collection of eleven original songs written by Thomas Anderson. 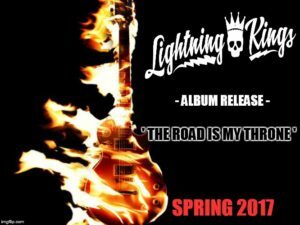 The Lightning Kings are comprised of Thomas Anderson on guitar and lead vocals, Matt Lind on bass, Rich Petko on keys and the late Ryan Petersen, who passed away this last September, providing drum work on the disc, with Seth Troublefield on backing vocals. Horn arrangements were put together by Anderson alongside Tim Baber and beautifully executed all over this recording by The Thunder Horns: Terry Baber on trombone, Malcolm Lewis and Eric Rabe on saxophones, and Ian Westbrook on trumpet. Also appearing on several numbers are The Jersey Queen Singers Jimi Campbell and Jennifer Del Villar. Everything was engineered and mixed by Tom Van Riper and the final mixes were handled by Terry Robb. The songs are almost all lengthy crafts spanning nearly five and a half minutes or more on all but two. And by crafts I mean that they have been meticulously arranged to keep your attention and to tell their stories no matter what the length. “Rules Of The Road” delivers in the best of Texas blues fashion, “Pimp W Girls” has a funkier approach. The Thunder Horns are at full force with Petko’s organ on the opening of “Texas Shuffle,” with Anderson coming in for another blistering guitar solo midway through this fiery instrumental. The moods of the songs can change from one to the next as well, as “Texas Shuffle” with its fast pace is followed by the more somber approached “Right Or Wrong” with piano, sultry sax and more guitar giving the mood of the song its feel. Perhaps my favorite number of the album is the slow blues “Love For You.” It is a spell-binding piece that brings to mind something akin to a Gary Moore feel with both the riveting guitar performance, tone and vocals. The disc closes with a short little jam between the artists named “Ryan’s Song” for the memory of their friend and drummer. It ends with a phone message left by Petersen for Anderson about his thoughts on the sound of his snare on a track, saying goodbye and that he’ll see him on Saturday. With The Road Is My Throne, his presence will always be with the group. The Road Is My Throne is a very strong release from The Lightning Kings. Filled with over the top instrumentation, lyrics and performance and very exceptional production. 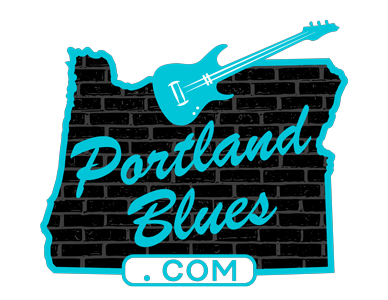 This should be something that will stick prominently in any blues rock fan’s player for some time to come.